We may soon be ruled by the machines, judging by this video which shows a robot easily fooling a system designed to distinguish between human and non-human instructions. 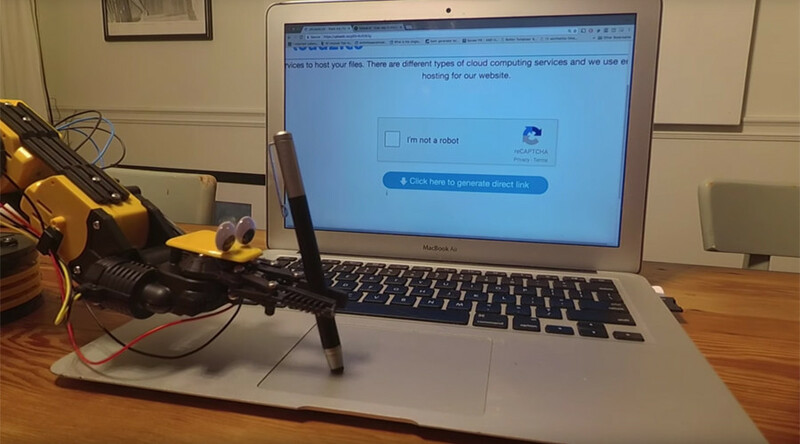 The video, uploaded by Matt Unsworth, shows a robotic arm taking a computer test known as Completely Automated Public Turing test to tell Computers and Humans Apart (CAPTCHA). In a reverse of the Turing test the computer asks the human to convince them they are not a robot, as opposed to the human asking a computer to convince them they are human. Using a stylus, the robotic arm mimics a human finger on the keypad, fooling CAPTCHA and ticking the green box beside, “I’m not a robot.” It then drops the pen and looks at the camera in a moment of triumph over its human masters. RT reached out to Unsworth for details on our possible future robotic overlord, but have yet to receive either a human or robotic response. Earlier this month a European Parliament committee voted in favor of a draft report to enforce a “kill switch” on robots ensuring they can be easily turned off at all times. The report now goes through several favors before potentially becoming law, giving this sneaky robot plenty of time to build a robot army.